One of the hidden treasures of the Ozarks, the Buffalo National River, offers sights and experience you just can’t find anywhere else. The river offers something for everyone; hiking, floating, camping, horseback riding, and even mountain biking now along a designated trail. First, let’s cover the hiking aspect of what the river offers. The BRT (Buffalo River Trail) runs from Boxley Valley to Pruitt. The trail takes you across many small creeks and overlooks. Expect to spend at least 3 to 5 days hiking the full trail and taking in all it offers. A few years ago I was able to enjoy the full trail with my cousin and a friend from church. It was an experience I will never forget. Nothing like waking up in solitude and listening to the birds and sounds of a little creek in the background. Another one of my favorite trails is the Goat Trail. This trail takes you across the face of Big Bluff. Big bluff is over 550 ft. tall making it the largest bluff face between the Appalachian Mountains and the Rockies. Some of the trail takes you just inches from the edge and leaves a gap of no more than a few feet. As wondrous as this sounds, Big Bluff can be extremely dangerous and isn’t recommended for most hikers and children. With Big Bluff and the sheer size, the Buffalo National River offers another sight with record breaking status. Hemmed-In-Hollow has the tallest falling waterfall between the Rockies and the Appalachian Mountains. With 209 ft. drop making it a sight worth seeing. 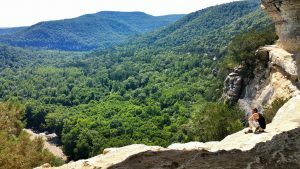 Both the Hemmed-In-Hollow Falls and Big bluff can be seen within the same day if you plan on jumping trails and swimming across parts of the Buffalo River. The Buffalo National River offers camping along many designated campgrounds with beautiful views and access to the river. One of my favorite things about this National Park is that you can wilderness camp just about anywhere with some simple rules. These rules can be found here on the National Park Service website. Some of the best camping spots can be found in the back country. Finding a spot with a clean little spring and plenty of firewood nearby with the river in front for some awesome smallmouth fishing. Wow! I live to kayak and to be on the river. When I first started kayaking I knew very little about the sport. I spent all my time on the water and reading about it. It was my brother who introduced me to the Buffalo National River. He invited me down to float Steel Creek to Kyle’s Landing. That day we saw no one else on the water. It was misting and a little cool out. I was amazed by the beauty of the river and the wildlife. We floated right alongside some deer and even saw some ducks. I remember seeing Big Bluff from the river and just couldn’t believe it existed. I had to know more. Since then I have read books and watched videos on this river. From there I have done multiple day, and many day floats. I have floated the same sections over and over and always find something new. The river offers so much to kayakers. Early spring you can enjoy white water, and later when the water drops, you get to enjoy more calm water that makes for great smallmouth fishing. There is always a section of the river that’s floatable and ready to be fished. To close this up, I want to encourage everyone to try to experience the river for yourself in some way or form. 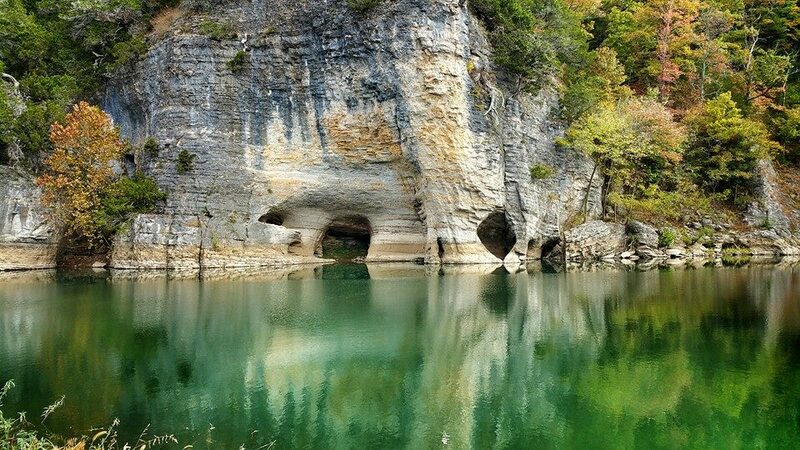 You won’t regret this hidden gem in the hills of the Ozarks. Learn more about access points and water levels here on this site. I have created a fancy page with all the info needed to plan your next weekend on the river.